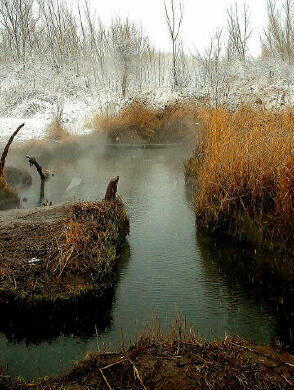 Saratoga Springs could be a wonderful place to soak in a natural hot spring and enjoy the wilderness on the shores of Utah Lake. One problem, this hot spring is located within 1/4 mile of a main road in a growing Utah community. This fact has caused the decay of the springs over the years. However, there is hope. Conditions at the hot springs have improved over the last few years. In 1999 the property where the springs are located was turned over by the state of Utah to Utah County. The county has made many improvements in the area. Local volunteers have also played a major role in cleaning up the hot springs, any help you provide on your visit will be appreciated. The hike into Saratoga Hot Springs is 1/4 mile from the trailhead. The hot springs can be reached year round and is particularly popular on Saturday and Sunday. Winter, Spring and Fall are the best seasons for visiting the hot springs. The springs are best avoided during the summer month's. Bring plenty of water since soaking in the hot springs can be very dehydrating. Go prepared to take a nice soak and don't forget a towel to dry off. Reaching the hot springs often involves hiking through several muddy or marshy sections of trail. The parking area for the hot springs is fenced and locked nightly. Anyone inside the fenced area after the posted closing time will be ticketed for trespassing. 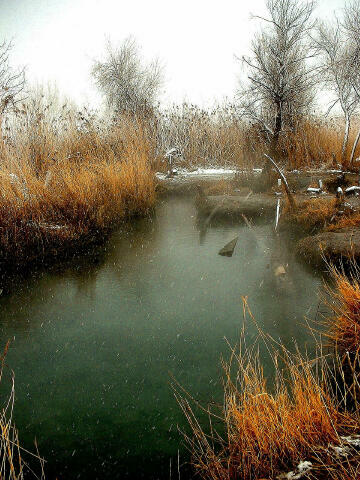 Utah County has increased patrols at the springs and enacted a new ordinance in its fight against skinny dipping. The county is making a serious effort to create a nice place to visit and to keep out the riff-raff. If you visit the hot springs please consider bringing a large plastic garbage bag and spending several minutes picking up trash and hauling it out. Several minutes of effort before you jump into the hot springs will result in a much more pleasant experience for everyone and hauling out the trash is no big deal since the trailhead is only minutes away. Because this hot spring is so easy to access it has the problem of attracting "Joe Six-Pack" and the rubbish he brings. This is a location, which could remain enchanting for many years with a little help from us all or become trashed in a hurry. Please provide a little extra effort and public service to create an enjoyable place to visit. 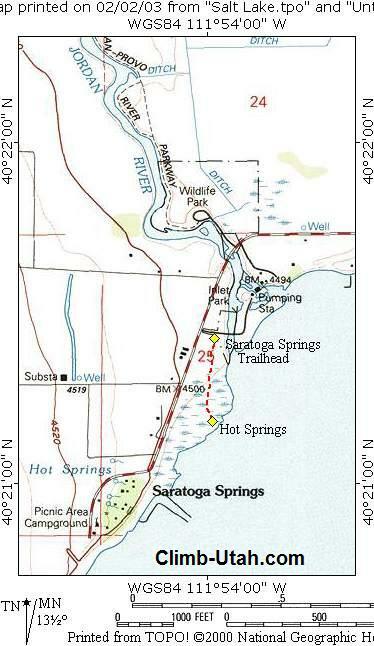 The USGS 7.5' map titled "Saratoga Springs" shows the hot springs. Navigation for this route is extremely easy. 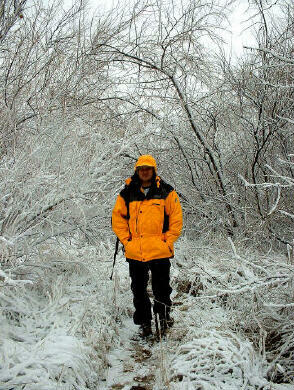 The trail is well used and easy to follow. If you want to keep Saratoga Hot Springs open to the public keep your swimming suit on and respect the Utah County ordinance against skinny-dippy. Yes I know it's fun to skinny dip with a beautiful woman but this place is too popular and too easy to access to continue the practice. At one time, clothing optional was the accepted practice at this hot spring but not any more. If this hot spring continues to attract those who flaunt the local community values the springs will be closed or destroyed. If we wish for this spring to remain open and accessible it is important that we police ourselves and pick up the thrash left by ourselves and by others. Now I will climb down off my soap box and quit preaching. From I-15 in Lehi, Utah, take Exit 282 and head west on Main Street (State Road 73). Follow Main Street west for 5.2 miles to a major intersection with Redwood Road (State Road 68). Turn south on Redwood Road and travel 2.3 miles to 400 South. Turn east and follow 400 South for 0.7 miles until it tee's with Saratoga Road. Turn North on Saratoga Road and travel 0.2 miles to the paved parking area on the East side of the road. 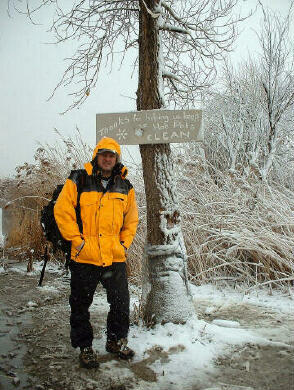 This is the trailhead. From the Saratoga Springs Trailhead (N40° 21' 26", W111° 53' 59") just follow the paved trail south. The pavement ends after 100 yards and you will be forced to follow any of several hiker made trails through the brush to the Hot Springs (N40° 21' 11", W111° 53' 59"). The springs are located 1/4 mile from the trailhead. Don't be to surprised if you soon find the route different than what is currently described here. Volunteers are planing to build a raised walkway on the marshy half of the trail and a bridge over a creek that intersects the path.